W front with doorway and a circular window over. Bell-turret on the top. That is C18. Side windows straight-headed and with uncusped lights. That is C16. But what is one to make of the E window? It is large and circular and has tracery of Second Pointed character: two interlocked triangles and daggers and trefoils in their interstices. Ther glass records a death in 1893. If the tracery is of that date, what was it like in the C18? The size of the circle is C18. That is proved by the ALTAR SURROUND, handsomely panelled, and so large a circle can hardly have been undivided. 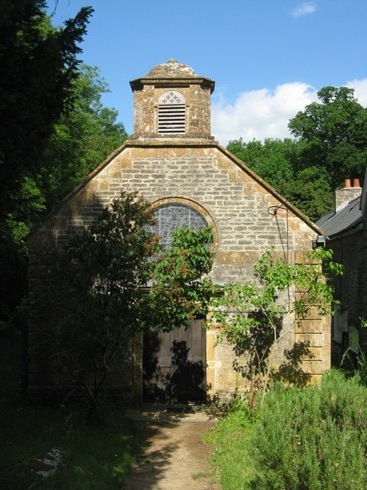 Monica Hutchings comments that the old rectory house was known as Lewcombe, and that this was the old name for the parish. Chatfield, M., Churches the Victorians forgot. Ashbourne: Moorland Publishing, 1979, pp. 32-34. 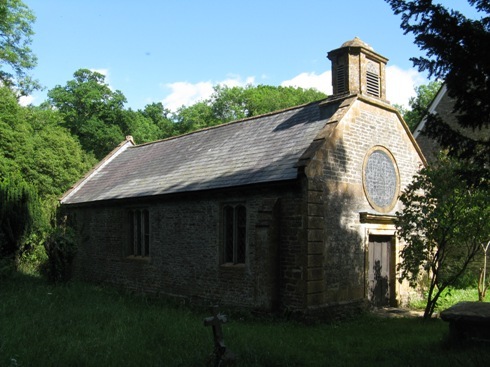 Dorset Historic Churches Trust, Dorset Churches. [Dorchester]: DHCT, 1988, p. 23. Hutchings, M. Inside Dorset. Sherborne: Abbey Press, 1965, p. 153. Hutchins, J. The history and antiquities of the County of Dorset, 3rd ed., edited by W. Shipp and J.W. Hodson, Westminster: J.B. Nichols, 1861-1873. Mee, A., ed., Dorset: Thomas Hardy's country. The King's England. London: Hodder and Stoughton, 1939, pp. 96-97. Newman, J. and Pevsner, N., The buildings of England: Dorset. Harmondsworth: Penguin, 1972, p. 252. Pitt-Rivers, M., Dorset: a Shell guide, new ed. London: Faber & Faber, 1966, p. 59. Royal Commission on Historical Monuments (England), Inventory of historical monuments in the County of Dorset, Vol. 1, West Dorset. London: HMSO, 1952, p. 90. The Church of St James, Lewcombe (East Chelborough), Dorset: the approach to the west door. Maintained by Michael Day, Last updated: 18 October 2010.